Avatar Has A Lock On Best Picture Nomination? Really? 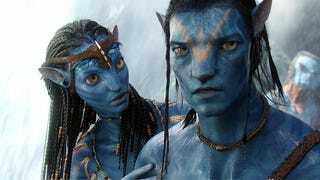 Yeah, according to leading Oscar soothsayers and prognosticators, James Cameron's Avatar has slid into the pole position. Is it worthy? Worthier than these three other genre flicks that should get the nod instead? It's clear, by this point, that James Cameron's bid at winning America's hearts, eyeballs, and disposable income has been successful: His revisionist take on the Blue Man Group's origin story has just about doubled its gargantuan budget back at the global box office. Which is fine. Spectacle definitely has its place, and that place is in the Ring of Awesome (which is right next to the Hall of Really Neat). But according to Oscar handicappers like Entertainment Weekly's "Diamond" Dave Karger, Avatar is now the film to beat in the Best Picture race. Which just feels wrong. Avatar may be a cinematic achievement, but it's not the Best Picture I've seen this year. It's not even the best genre picture I've seen this year. Here are three others that deserve that prize more than Cameron's Folly. It might occasionally wield its racial-tolerance metaphor with a heavy hand, but Neill Blomkamp's aliens-among-us flick taps into science fiction's rarely used — on film, anyway — power to reflect humanity back on itself. As thrilling as Avatar, and smarter by a mile. This feature debut from writer-director Duncan Jones makes isolation an art form with this perfectly modulated story of a man (Sam Rockwell) on a solitary tour of duty in a lunar mining base who incrementally loses his mind. As incisive a look at what it means to be a girl and related to a gaggle of strangers as you're likely to find, animated or not. Director Henry Selick took Neil Gaiman's novella, employed handcrafted wizardry and storytelling expertise to deepen its themes of desperation and heroism, and made a kids' movie that frightens while it fulfills. No, J.J. Abrams reboot isn't a perfect film — that massive deux ex machina in the middle (Kirk just happens to stumble upon the one ice cave, on a planet full of ice caves, that's got a Spock in it?) siphons off a decent chunk of credibility — but it's got a ton of heart, some fantastic performances, and it accomplishes the yeoman's task of reviving a moribund franchise with high style.